Avocado oil is generally great for skin – from soothing skin issues, increasing the health of the scalp and boosting collagen production, Avocado oil is a good addition to a soap. I also had a look at a soap that is easier to get hold of locally – I didn’t use it last time because I specifically looked for a salt with no added iodine which is actually hard to find around these parts. Checking out the packet, it seems that the amount of added iodine was rather small so I thought it would be worth chekcing out. Too much iodine (or other minerals) can make the soap “weep”, where these minerals come to the surface and leave a wet layer on the soap, but I wanted to see if this new salt would be an issue. Other than that, I kept things pretty much the same – the amount of salt needed, the superfat and so on – so that I could really see the differences between the older recipe and the new one. The results are a lot better – less blending of the colours together and some more visable swrirls. Less is indeed more. It can be hard to do as with my moulds (loaf moulds) the results can only be seen once the soap is cut, so this is certainly an area where practice and experience is required. 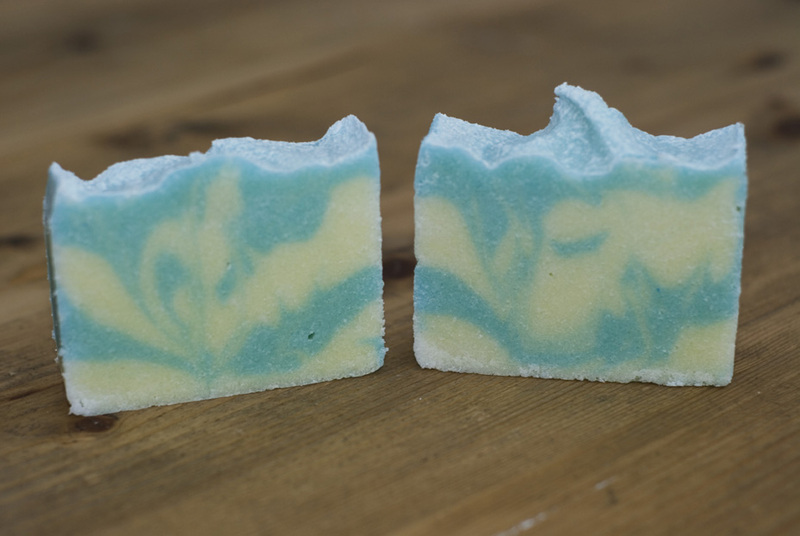 Unlike last time, I decided to scent the soap with a White Tea fragrance oil which goes very nicely with the salty freshness of the bars and the pastel colours. In use, it lathers beautifully and leaves the skin feeling fresh and clean, but not dried out. Very happy with the results indeed!